In a suburban community a six lane road is built. It serves schools, businesses, and transit routes. Along the length of the highway pedestrian paths are beat into the grass. For pedestrians it isn't comfortable, it isn't accessible, and it isn't safe. It needs a sidewalk. Walkways can be created either by providing stabilized or paved surfaces separated from the roadway, or by widening paved shoulders. These treatments can not only improve the safety of pedestrians, but also make pedestrian trips more viable. Sidewalks separated from the roadway are the preferred accommodation for pedestrians. 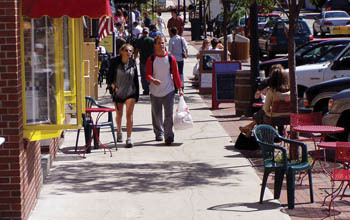 Sidewalks provide many benefits including safety, mobility, and healthier communities. Providing walkways for pedestrians dramatically increases how well pedestrians perceive their needs are being met along roadways.5 The wider the separation between the pedestrian and the roadway is, the more comfortable the pedestrian facility. 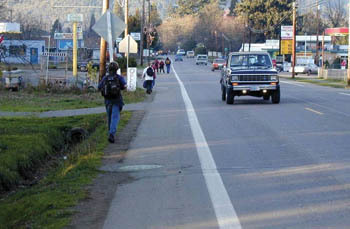 By providing facilities that are more comfortable, we can increase the number of trips made by walking, particularly in areas with mixed land uses.6 Providing sidewalks, widened paved shoulders, or stabilized shoulders—particularly when providing access to public transit—can increase the transportation options for individuals who may not be able to drive a car. Additionally, by moving pedestrians off the travel lanes, motorist operations are improved and capacity increased. Provides a stable surface off of the roadway for pedestrians to use when sidewalks cannot be provided. 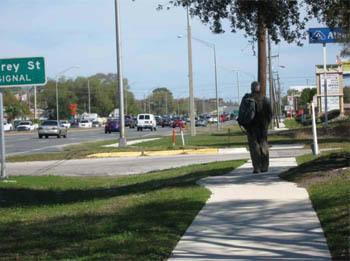 Before the installation of sidewalks, Dale Mabry Highway (SR580) in Tampa, Florida was not a place anyone would feel comfortable walking. Dale Mabry is a commercial corridor with six lanes of traffic, a five foot shoulder, and transit service stopping along the route. Many vehicles using this corridor are traveling faster than the 45 mph posted speed limit and pedestrian crashes were all too common. Even before construction was completed, pedestrians were using the sidewalks. Pedestrians can now walk in a safe location off the roadway/shoulders on separated accessible sidewalks. Accessible sidewalks or pathways should be provided and maintained along both sides of streets and highways in urban areas, particularly near school zones and transit locations, and where there is frequent pedestrian activity. NHTSA, Traffic Safety Facts 2008 Pedestrians, NHTSA, Washington, D.C., 2009. FHWA, Pedestrian and Bicycle Crashes of the Early 1990's. Publication No. FHWA-RD-95-163, FHWA, 1995. FHWA, An Analysis of Factors Contributing to "Walking Along Roadway" Crashes: Research Study and Guidelines for Sidewalks and Walkways. Report No. FHWA-RD-01-101, FHWA, Washington D.C., 2001. FHWA Investigation of Exposure-Based Pedestrian Accident Areas: Crosswalks, Sidewalks, Local Streets, and Major Arterials. Publication No. FHWA/RD87-038, FHWA, Washington, D.C., 1987. NCHRP Report 616, Multimodal Level of Service Analysis for Urban Streets. TRB, Washington D.C., 2008. Florida Department of Transportation, Conserve by Bicycle and Pedestrian Study Phase II. FDOT, Tallahassee, FL, 2009. Center for Disease Control, A Report of the Surgeon General, Physical Activity and Health, At-A-Glance. CDC, Atlanta, GA, 1996. 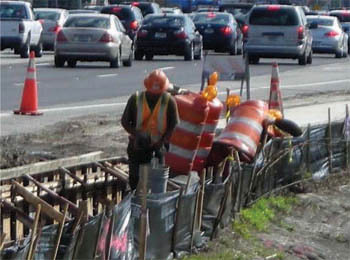 Florida Department of Transportation, Update of Florida Crash Reduction Factors and Countermeasures to improve the Development of District Safety Improvement Projects. FDOT, Tallahassee, FL, 2005. Lindley, J., Guidance Memorandum on Consideration and Implementation of Proven Safety Countermeasures FHWA, Washington D.C., July 2008.